Westchester was alive with The Sound of Music as Broadway Training Center staged Rodgers and Hammerstein�s signature collaboration at the historic Irvington Town Hall Theater, delivering a show with both strong moments of family drama and a surprising amount of comedy as the Austrian Von Trapp Family falls in love with Maria and music amidst the rise of the Third Reich. 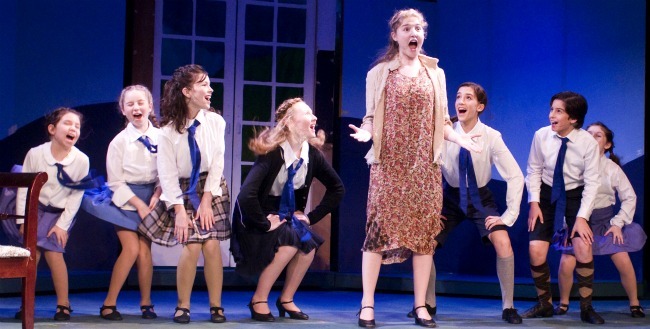 Wynnie Van Dusen stars as the wayward postulant Maria who can�t stop herself from singing, or from falling in love with Captain Von Trapp and his seven children, or from nailing a bit of improv when a part of the set�s window frame breaks off in her hand. A minute later, while offering her nightly prayers for the new children she is watching, she also prays for forgiveness for the window break from housekeeper Frau Schmidt. Opposite Maria, Daniel Polonsky plays the captain � an angry and bitter man whose bitterness melts into held-back tears when Maria brings music back into his life through the voices of his children, and when singing of his beloved country�s flower in Edelweiss. Together, the captain and Maria share a very original and fun rendition of the often bland Something Good. But not everyone in Austria is enamored of their budding romance. Namely Baroness Schraeder (played by and sung beautifully by the amusing Elise Swift) who is looking to tie a marital and commercial knot with the captain. She is joined on her visit to the Von Trapps with their mutual spongy friend Max Detweiler (featuring the entertaining Clara Reyes) who is scouting the next hot new singing act. The two of them share a couple rarely performed musical numbers themselves, delivering the diverting duets How Can Love Survive and There�s No Way to Stop It. Then, of course, there are the seven children. 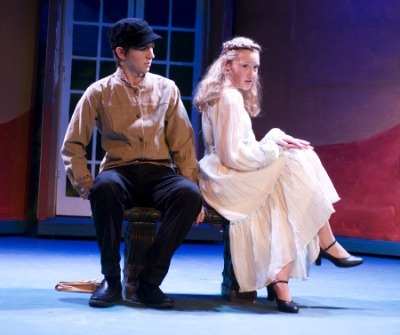 They are led by Anna Fondiller as sixteen-year-old Liesl who shines in a charming duet of Sixteen Going on Seventeen with suitor Rolf (Matt DiMona). All seven combine for such great scenes as Do-Re-Mi and My Favorite Things, while a couple other standouts in BTC�s cast include a music festival solo by Marina Sneider and a hilarious performance by Sophia DeLevie-Orey who uses attitude and a natural sense of humor to turn the role of Frau Schmidt into a uniquely memorable one as she maintains Von Trapp�s musical mansion, broken windows and all.